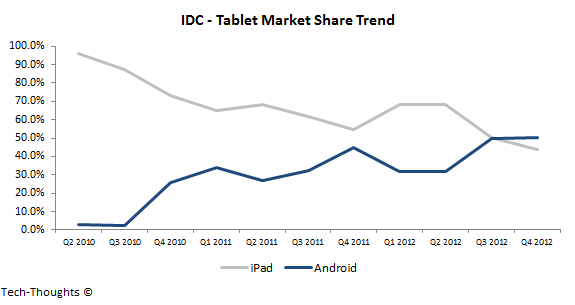 IDC recently released their tablet market estimates for Q4 2012 and I have to say, the figures were surprising even to me. I have been commenting on the similarities between demand patterns in the smartphone & tablet markets for some time now, stating that Android tablets would overtake the iPad by mid-2013. Quite surprisingly, that already seems to have occurred. Let's take a look at the sustainability of this change of guard. Let's begin by first converting IDC's shipment figures by OEM to shipment figures by platform. This is usually not very difficult, as the only significant non-iPad and non-Android tablets on the market were the Blackberry Playbook and the HP Touchpad. However, with the launch of Windows 8 and Windows RT based devices, we now need to take them into account as well. We know that the total tablet shipment volume in Q4 2012 was 52.5 million units, of which the iPad accounted for 22.9 million units (incl. the iPad Mini). From Blackberry's results, we know that 255,000 Blackberry Playbooks were shipped in the quarter (a rough guide as the quarter definitions are off by a month). IDC also mentioned that Microsoft Surface RT shipments totaled just 900,000 units in Q4. Combining this with Digitimes' estimate of 2 million shipments of Windows RT based devices, we get a total of 1.1 million shipments of Windows RT devices, excluding the Surface RT - we can add another 0.9 million shipments of Windows 8 based tablets (given the widely reported lack of availability). Excluding the Blackberry Playbooks and Windows based tablets gives us a total of 26.4 million Android tablet shipments, for 50.4% of the market. As I had predicted, while the iPad Mini helped boost iPad demand, it did nothing to slow down the ascent of Android tablets. Android tablets have now outpaced the iPad's sequential growth in 6 out of the last 8 quarters and I expect this general trend to continue. 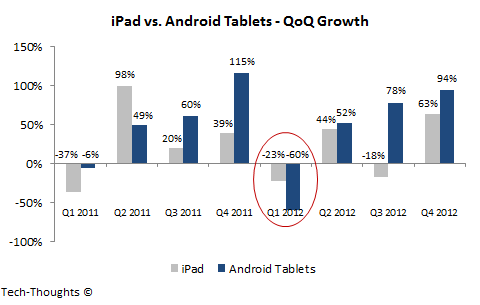 As we saw last year, tablet shipments usually see a steep decline in Q1. This is driven partly by weaker sequential demand and partly by inventory build-up into the channel. Kindle Fire shipments shrank by more than 85% sequentially because of an inventory build-up, while demand seasonality caused shipments of all other Android tablets to shrink by 44% (shipments of Samsung & Asus devices shrank by 20% and 40% respectively). This seasonality in demand was driven by the holiday season in the US & Europe, which were the core market for tablets. Demand in emerging markets tends to be less seasonal, so as emerging market demand grows, seasonality should reduce. More importantly, mature market focused OEMs should see greater seasonality of demand (primarily Amazon, B&N and to an extent, Apple). At this point, since we don't have much data to accurately estimate the impact of emerging market tablet demand, my estimates can be considered conservative. New low cost offerings from various Android tablet OEMs (primarily Samsung, Acer, Lenovo, Asus) could change demand patterns and nullify seasonality to an extent. iPad - I expect iPad shipments to shrink by roughly 20% (slightly better than Q1 2012) to ~18 million units, as any delayed iPad Mini purchases are likely to be balanced out by shrinking demand for the full-size iPad. In addition, the iPad Mini should see stiff competition from lower priced devices in emerging markets. Amazon - Kindle Fire shipments are likely to see the largest drop, by about 60%, to ~2.5 million units - I've considered a smaller drop this time as initial launch-driven channel filling occurred in Q3, as opposed to Q4. Samsung - Samsung tablet shipments should fall by 20% (in line with Q1 2012) again to ~6 million units. Samsung's marketing muscle could help minimize the impact of demand seasonality. Asus - I've forecasted a 20% decline in Asus' shipments as well, to about 2.5 million units. This is because Asus already seems to have shipped 6 million Nexus 7 tablets until the end of January (the count was 5 million at the end of Q4). So if Asus has shipped ~1 million Nexus 7 units in January, another 1.5 million total tablet shipments in the quarter seems fairly reasonable. 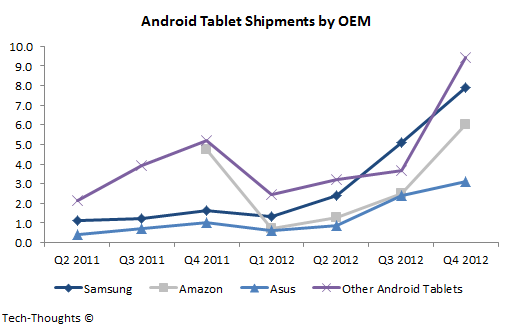 Other Android Tablet OEMs - I've considered a 40% decline in shipments of other Android tablet vendors (incl. Acer & Lenovo). These vendors saw a sequential decline of more than 50% in Q1 2012, but stronger emerging market demand and lower cost offerings should help them hold on. I consider this segment to be the most sensitive to emerging market growth. Windows 8 & Windows RT Tablets - Given the low sell-through rate and high returns seen in this segment, I see a sequential decline in shipments. The price of the Surface Pro should do nothing to stimulate demand. 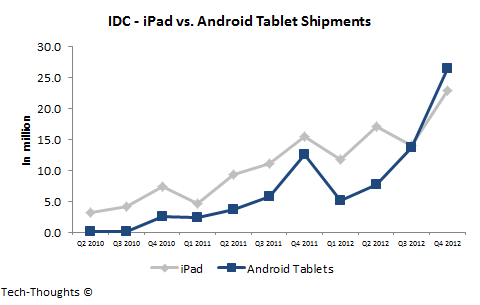 This puts the total shipments of Android tablets at ~17 million units, about one million units less than the iPad. However, I expect shipment growth of Android tablets to continue to outpace the iPad after Q1, resulting in a permanent change of guard. Of course, greater than expected emerging market demand could put Android tablets firmly in the driver's seat in Q1 itself. elegant post, thanks for your Exertion. When one repeat a lie long enough it becomes the truth. Actually there is more evidence that Android's share in both the Phone and Tablet market is simply a mater of market growth being higher than Apple's supply. Apple re-took the majority of smartphone sales in the US market last quarter (took 1st place in all phones for the 1st time) and lost share while growing very fast (45%+++) as supply was very limited for iPad's. In the US market at least Apple has shown the Android market is mostly a I can't get an iPhone market, and the tablet market is snapping up to be about the same only Apple is in a much better position to ramp production on iPads than they were in phones. Internationally the same is true only price on un-subsidized phones is as much an issue as supply. It's really interesting how many people are quick to dismiss any data that doesn't conform with their view. It's also funny that people suddenly consider IDC data worthless, and NetApplications and Chitika as respectable companies, when IDC data was quoted by Apple during product launches. The core issue is that there seems to be this confusion between install base data vs. sales data and US data vs. global data. Chitika and NetApplications only measure US usage data (which should be skewed towards Apple). Statcounter seems to be the only organization that measures somewhat global data (I say somewhat because I'm still unsure if the sample is representative enough) - their data shows Android with a considerable lead over iOS (incl. tablets). Going back to Chitika's US data - it shows that the iPad has a considerable lead but it losing ground. This is because sales data is a leading indicator for install base. As sales of one platform increase, their share of usage increases (but the base is relatively small because of sales over the past 3 years). This is essentially the same pattern we saw in the smartphone market. I don't understand why people are so offended by this. Apple's shipment performance in tablets is quite good and will remain good for a while. It's just that another platform is growing faster. This isn't "class warfare" or purely the impact of cheap, black, low quality plastic things. Today, there are high quality tablets available at numerous price points and that's affecting sales trends. The market trends (& the reactions from certain quarters) reminds me of the smartphone market in 2010.
and you don't see a problem with that? So they're false only when they show Apple losing a market share lead? Apple seems to think enough of IDC to include them in their product launch presentations. And I'm not sure why I need to clarify this, but insulting comments tend to get filtered out by my comment management system. Numerous insulting comments result in a block. The reason I run such a tight comment management system is because my time is better spent analyzing the numerous sources of data available, as opposed to carrying on conversations that add no value. IDC's data has rarely proved correct in the past. And Net pplications data is not US centric ("The network includes over 40,000 websites, and spans the globe." ). There is not real evidence that Android sales are what people like IDC say and there is a lot of data that is not. Android has never shown up in web traffic data (and arguably iOS would be less than site based traffic as much of iOS traffic is application based not browser based). And the only real data on Android sales has been Samsung's data in the Apple Law suit that clearly showed the Analysts massively over estimated their market share. People get angry when writers keep quoting estimates when all real data clearly shows the "estimates" are wrong. 1. IDC's estimates have never been proved incorrect. They have been accurate enough for Tim Cook to use their data in the iPad 3's launch presentation. I don't know where this misconception comes from. Their forecasts, on the other hand, may have been incorrect (analyst firms rarely get forecasts right, as they aren't based on any underlying, current data). One way to gauge the accuracy of shipment data is to compare the figures across research firms (Strategy Analytics, Canalys and IDC's numbers are remarkably consistent). 2. NetApplications has publicly admitted that their data is skewed. If you'd like to see global usage data, try Statcounter - they have usage share data across the globe and by country (unfortunately, they don't break data down by OS). In Statcounter's data, iOS (incl. the iPad) has a lead in the US (consistent with NetApplications data) and is trailing Android globally. 3. Samsung's data from the US lawsuit is, unsurprisingly, only for US sales and upto 2011. That was a time when Android sales were dominated by another firm, HTC. It wasn't until 2012 that Samsung gained traction in the US. Cherry picking data normally gives a skewed opinion of the industry. All data needs to be taken into account, and put in the right context. Read at the bottom of the chart: "Data is representative of U.S. and Canadian tablet web traffic only!"